After a two-hour dinner, Mr Barnier emerged from the British residence in Brussels having told his negotiating counterpart that the EU will continue to refuse alter the Irish backstop, the mechanism to avoid a hard border. Theresa May sent Mr Barclay and her European advisor Olly Robbins to hold official negotiations for the first time since the draft EU withdrawal agreement was signed off by European leaders in November last year. Tonight’s meeting was described as “constructive” by the UK Government, who have pledged to continue negotiations until they reach a compromise acceptable to MPs in Westminster. A UK Government spokesman said: “Secretary of State for the Department for Exiting the European Union Stephen Barclay and Michel Barnier followed up on last week’s meeting between the Prime Minister and President of the European Commission Juncker to discuss the next steps in the UK’s withdrawal from the EU and explore whether a way through can be found that would be acceptable to the UK Parliament and to the European Union. 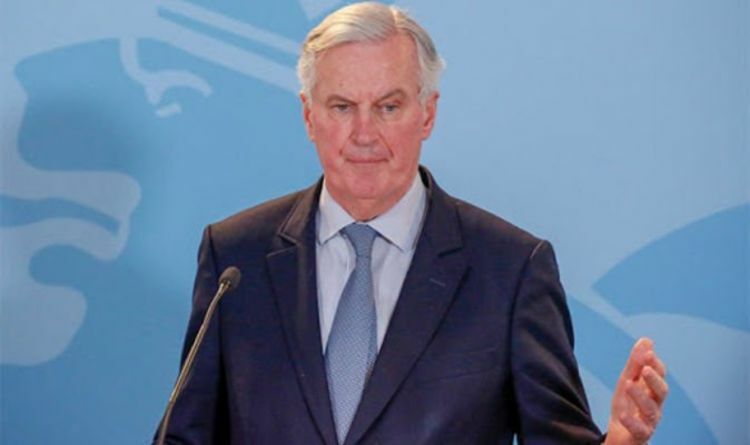 Of the meeting, an European Commission official said: “Michel Barnier met Stephen Barclay, the UK Secretary of State for Exiting the EU, for a working dinner this evening in Brussels to follow up on last week’s meeting between President Juncker and Prime Minister May. Mr Barclay and Mr Barnier, who were also joined by Sir Tim Barrow, the UK’s EU ambassador, and Sabine Weyand, the EU’s deputy chief negotiator, dined on pan-fried North Sea sole with Scottish scallops and Welsh samphire and roast duck breast with peppercorn sauce and Pembrokeshire potato dauphin. Mr Barclay will now travel to Strasbourg with David Lidington, the de facto deputy prime minister, to meet senior MEPs including Guy Verhofstadt, the EU Parliament’s Brexit co-ordinator. Earlier today, Mr Barnier insisted “something has to give” on the British side for Brexit deadlock to be broken. Speaking in Luxembourg, he said: “We’re waiting for clarity and movement from the UK. On his meeting with the Brexit Secretary, Mr Barnier added: “Tonight I will repeat the EU’s positions. I will listen to what the secretary of state has to tell us concerning the alternative arrangements which the UK would like. The French negotiator risked the fury of Brexiteers by praising the push by Labour leader Jeremy Corbyn to urge Mrs May to draw up plans to remain in the EU’s customs union. Labour’s shadow Brexit secretary Sir Keir Starmer accused the Prime Minister of “running down the clock” in the run up to the March 29 exit date. Mrs May’s parliamentary allies in the Democratic Unionist Party once again insisted the Irish backstop remains at the “central problem” in the Brexit deadlock. Nigel Dodds, the DUP deputy leader said: “Whilst the focus will return to Brexit in Parliament this week, the backstop remains the central problem and it must be dealt with. “The Prime Minister has committed to securing legally binding changes to the Withdrawal Agreement. Those changes will be required for Parliament to support any deal. “The EU cannot continue to hark back to a proposed deal which was comprehensively rejected by the House of Commons. There is no agreement without Parliament’s support. “Some of the language and rhetoric employed last week was not conducive to making progress and securing the agreement we all want to see. Whether it is the European Council or former UK prime ministers. It’s time to dial down the rhetoric and focus on solutions rather than scaremongering. “Over the next number of weeks the options will become increasingly clear, particularly for the European Union. If the political will is there then an agreement can be achieved. BoJack Horseman season 6 Netflix release date: Will there be another series? Emmerdale spoilers: Robert Sugden shot by Lachlan White as he tries to save Liv?